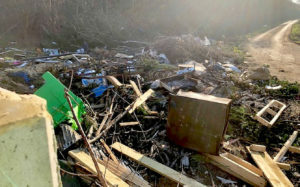 A FROME resident is calling on Mendip District Council to do more to combat the ongoing fly-tipping problem in the Gypsy Lane area. Local man, Ashley Reay, who lives nearby to Gypsy Lane, says that despite attempts by the district council to combat fly-tipping in the area, including road closures, the problem persists. He has suggested that the council should make more regular checks of the area and clear rubbish more often. A Freedom of Information request by Ashley revealed that the road was cleared twice in 2018 – once in March at a cost of £4,784, and again in December at a cost of £1,910. To combat the fly-tipping problem, Mendip District Council enforced road closures in the area in 2016, closing Gypsy Lane to vehicles. Concrete barriers were also erected to restrict access. Berkley Lane was also closed, from the north side of the Pines Residential Site to its junction with Dark Lane. In response, a Mendip District Council spokesperson told Frome Times, “Mendip District Council are aware of the ongoing issues at Gypsy Lane and are applying measures to combat the issues. We are currently working with local residents and adjacent land owners in order to apply suitable measures. It is foreseen that these measures will be applied in spring 2019 and as such, a large scale clearance of the site will be arranged in support of this. Following this, normal scheduled clearances will be arranged as issues are reported to us. “Local residents can also help us tackle fly-tipping by checking that anyone who is disposing of their rubbish carries a waste carrier licence. If they don’t have a licence, don’t use them. Residents have a legal duty of care to take reasonable steps to ensure a licensed waste carrier removes their waste or they risk ending up in court with a criminal record and a fine of up to £5,000.